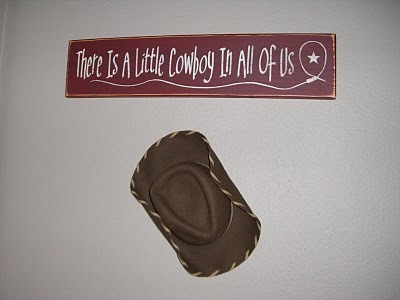 Home » All Genders » Ride ‘em, cowboy… the nursery’s done! 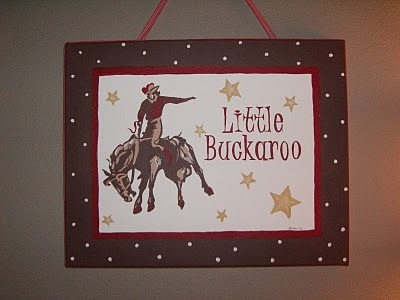 Ride ‘em, cowboy… the nursery’s done! The nursery is done… just awaiting the arrival of “Chip!” With our little guy due any day now, I was feeling the pressure to get the nursery finished. We converted my old office into the baby’s room. It actually worked out well that we were going to have a boy; my office was painted a taupe/beige color, which meant I (or, rather, my husband) didn’t have to paint the walls (I gained big brownie points with my husband for this one). My inspiration piece was this cute bumper I found one day while tooling around on eBay. 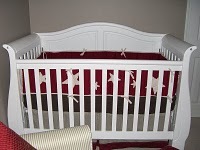 It’s from Pottery Barn Kids and I really loved how it was both simple and bold. I wanted to go with a theme that might transition well into toddlerhood, so I decided to go with a cowboy-themed room. Of course, I had to do a painting for Chip’s room. It was actually one of the quickest and easiest paintings I’ve ever done, but it turned out to be one of my favorites. 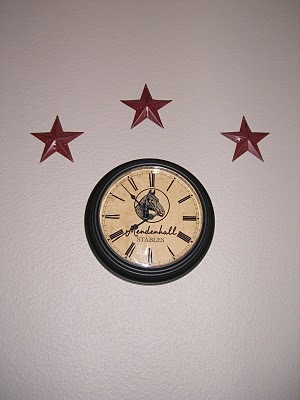 The clock and stars were another eBay find. There’s a great little shop that does custom clocks at a pretty reasonable price. I hung the hammered tin stars throughout the room.